Is a Dollhouse the Best Toy Ever? We Have Come Up with Some Pretty Convincing Reasons Why it Just Might Be! Regardless of the occasion, a dollhouse is one of the most special gifts you can give a child. 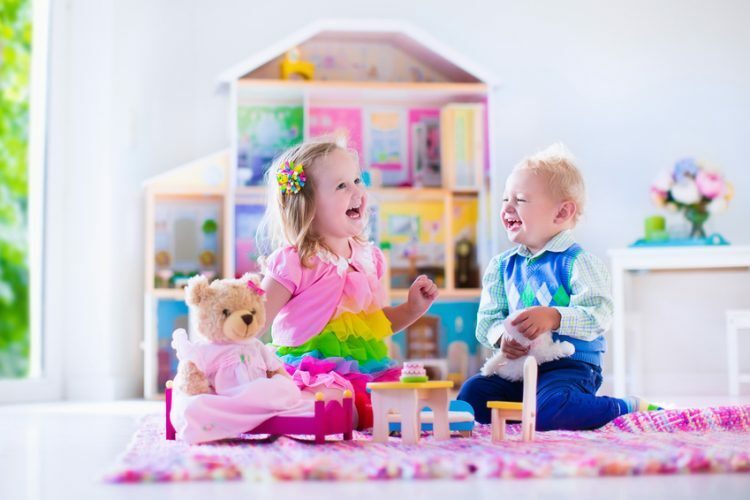 Children can have hours of fun playing with the dollhouse, rearranging the doll house furniture and creating scenarios that replicate real life situations. However, a doll house is more than just a fun toy; there are also many benefits to a child playing with these fun mini houses. Let’s look at a few reasons why dollhouses could easily be considered the best toy ever. Anyone who has ever observed a child playing with their doll house will know how absorbed the child can become in the activity. Their entire focus is on the house and the scenes they are creating as their imagination runs wild. A child will often plan a story-line and the roles that each character plays in this story. To do this successfully, a child must make decisions and solve problems. Decision-making and problem-solving are transferable skills that they will use throughout their lives in a variety of situations. It may seem strange to think that a toy as simple as this will help a child to develop these skills, but a dollhouse is very different to the technology-based games that are so popular with children in the modern world. A dollhouse will encourage a child to use their imagination, be creative and set their own goals in the games they play. 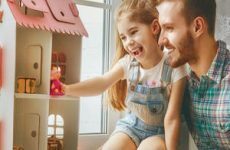 If you have a child that is having a hard time with the concept of sharing, then introducing them to a doll house may completely change their perspective. Sure, keeping all of their toys to themselves may seem like a good idea, but they will soon find out that it can be even more fun if you have someone to act out other characters. Not only does it teach them to share, but it can also help them to develop their social skills as they go back and forth with their playmate. And depending on the project they are working on together, dollhouses can help to foster a sense of community as well as team work. This is especially beneficial if the whole family gets together to play. This is isn’t to say that doll houses can only be enjoyed when played with in groups. They are also great when children want to play by themselves. If your child has access to several dolls, then they can easily switch from one role to the next. They can be as interactive as they would with a large group of playmates. Buying a dollhouse for toddlers is a fantastic way to support their speech and language development. When children are acting out the roles of their characters, they will often repeat words and phrases they have heard when listening to adult conversations. This will extend their vocabulary and they will begin to use these newly learned words in their everyday conversation. There are many advantages to playing outdoors, especially in terms of health and fitness. However, outdoor play is not always an option; the weather may be too hot or too cold, you may not have space for outdoor play at your home, your child may feel unwell or they may prefer indoor play. On the days when you need an activity to keep your child entertained indoors, a dollhouse is something that will keep them happy for hours. Any physical activity can help to improve a child’s coordination. Usually, doll house furniture is small and this takes both concentration and coordination to move around the home. Rearranging the furniture and playing with dolls in a small space will enhance a child’s fine motor skills. Another aspect of social development that is improved by playing with dollhouses is their attitude towards others. Playing with dolls teaches a child empathy and how to be caring and nurturing. If they play with another child, they will also learn respect. One of the things that children love most about dollhouses is the ability to customize the toy to meet their own needs. There are plenty of doll houses to choose between and each of these can be customized in its own way. Even the most basic dollhouses give a child the option to rearrange the furniture in a way that suits them. Many dollhouses have other ways in which a child can personalize their house. For example, some KidKraft dollhouses come with stickers so that a child can change the décor. Another example is the Barbie dollhouse that allows a child to customize the voice-activated sounds the dollhouse makes using an app to record their own voice or sounds. For a truly customized house, your child may prefer dollhouse kits that allow a child to make their own dollhouse from scratch and then add décor that suits their tastes. While some of these come with furniture to build, there are others where you will need to buy the dollhouse furniture separately. There are endless options of accessories you can buy for all types and styles of dollhouses. This provides even more options for a child to customize their little house in their own style. It also gives your child more play options. A further reason why a dollhouse is such an amazing toy for children is that it there are multiple options available. This means that you can choose a dollhouse to suit the age of your child, their personal interests, their preferred style, your budget and the space you have available. The first thing to think about is the type and style of doll house you want. Think how your child plays with their dolls as this will help you to choose the right style. For example, do their play scenarios reflect family life or do they imitate the actions of teens? If the former is the case, then they will probably prefer a traditional-style dollhouse. If the latter better describes their play, then a Barbie house is probably more suited to your child. You should also think about the features you want in a dollhouse. If you are choosing a dollhouse for toddlers, then you may be happy with a basic design. However, for an older child, you might opt for a doll house that has features such as lights and sounds that give a child a greater interactive experience. In terms of budget, there are houses to suit every price range. Take your time to research what is available that you can afford. Also, there are often price reductions or offers that mean you can get a cheap dollhouse. Dollhouses are more than just a toy. Some doll houses are exquisitely designed and add to the décor of a child’s room. In fact, some are so pretty that they are the perfect focal point for a room. You can even buy a dollhouse before your child is old enough to play with it and use it as a decorative item until it can be used for play. You can buy dollhouse bookcases or bookshelves which serve as a practical toy storage item as well as a fun element to a child’s room. While many toys are played with for just a few hours before being discarded to the bottom of the toy-box, a dollhouse is a gift that can last a lifetime. Many people who have had one in their childhood keep it to pass on to their children and then the next generation. Some dollhouses even become collector’s items, so they have the potential to make you money in the future. This is particularly the case if you have a KidKraft doll house a Barbie house or a doll house from one of the other top brands, such as Greenleaf, Melissa & Doug or Fisher-Price. Many toys are age-specific and your child will quickly grow out of playing with them. This is not the case with dollhouses as they are a gift that is suitable for children of any age. There are some that are suitable from toddler age right into the teens. You have the option of changing the furniture, accessories or décor to suit your child as they grow. However, if you choose, you can opt for a dollhouse that is suited to the age of your child as some dollhouses are ideal for toddlers and others for older children. Trends are constantly changing and, as a result, toys become popular and then go back out of fashion. Children always want to follow the current trends and you will buy many toys that turn out to be a fad. A doll house is a gift that is unaffected by trends. In fact, they could be described as timeless. Therefore, it is a toy that your child can enjoy for a longer period of time than many of their other toys. When looking for the perfect gift for your child, a dollhouse is an excellent choice. Your child will have endless hours of fun and enjoyment from this toy. In addition to the pleasure it will bring, there are many advantages to playing with a dollhouse in terms of the development of your child. Furthermore, it is a toy that will grow with your child and may last them a lifetime.